Galax is currently a wild collected crop with a major impact on the economy of rural Western NC. Current and projected market demand is expected to exceed current sustainable supply. In addition, public lands may become closed or severely limited for galax foliage harvest. Either could destroy this important regional agricultural enterprise. Galax (Galax urceolata, formerly Galax aphylla) is a low growing evergreen herbaceous perennial native to the southern Appalachian Mountains from AL to W. VA. Native habitat is moderate to dense shade in relatively dry, in fertile forest soils. 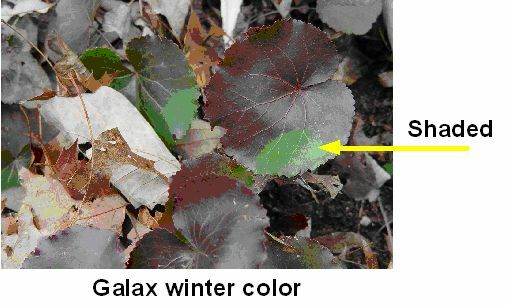 Under natural growing conditions, galax leaves that are exposed to light, such as during winter in deciduous forests, often turn maroon red during the winter. Following the spring return of deciduous forest foliage, galax leaf color turns back to green. White flowers are borne in late spring in a raceme on a non bracteate scape, thus the common name wandflower (Cullina). Foliage typically lasts two growing seasons, then dies in the third. Drought tolerance in lab tests is akin to survivor plants from the Sonoran desert (Newfeld). The round, glossy leaves of galax are a valued commodity in the international florist trade because they are sturdy, attractive and have a long shelf life. It is estimated that up to 2 billion leaves are harvested annually with a value of over $20 million to local collectors along the Blue Ridge escarpment. The sustainability of this harvest is currently being evaluated by the US Forest Service and National Park Service (Greenfield). No galax is currently grown for commercial foliage harvest and only a limited quantity is available from specialty mail order nurseries and botanical garden plant sales. Developing the economic potential of this native plant is limited by a lack of production information. Therefore, a series of experiments related to galax propagation and container culture was undertaken. All studies were done in standard MHCRS azalea growing media following initial trials with media comprised of various ratios of vermiculite, perlite, sand, peat and southern pine bark. A very well drained acidic mix worked best. The MHCRS azalea mix is 80:20, v/v, pine bark: Canadian sphagnum peat in which 5 lbs/cu. yd. of ground dolomitic limestone and 1.5# Micromax are thoroughly mixed. PROPAGATION: Seeds were collected from multiple North Carolina Blue Ridge mountain provenances. Viable seeds existed October through December of 2001 and 2002. There is no stratification or scarification requirement for germination (Cullina). Photoperiod had no effect on germination. 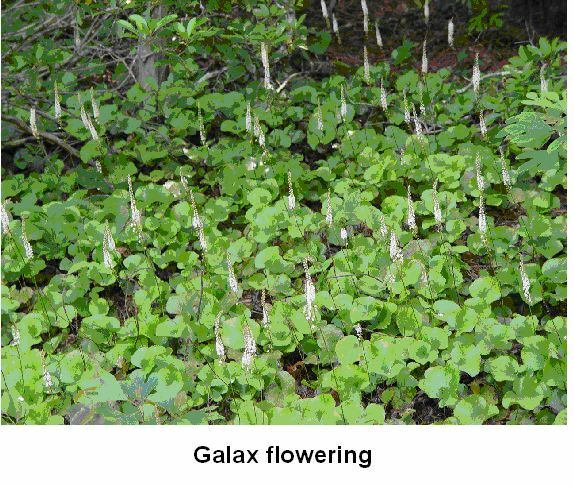 Galax is a rhizomatous species, often with large colonies that represent a few genotypes. Little regeneration from seed is apparent in natural stands. A waste product of “galax pulling” is often root and rhizome pieces. Depending upon the season, 21 to 42% of trimmed waste at commercial packing facilities consists of rhizomes. Experiments were designed to determine the impact of soaking rhizomes in water, quick dips with IBA and/or GA3. PROPAGATION: No increase in percentage of rhizomes breaking vegetative buds and developing a viable root system existed from 1250, 2500, 5000 or 10,000 ppm K-IBA or IBA salt in alcohol quick dips. There was a similar lack of response to 15 min. soaks in 500 or 1000 ppm GA3 whether the whole rhizome or just the distal half was soaked. Soaking rhizomes overnight in tap water significantly increased rooting, vegetative bud break and survival. BUD DORMANCY: Galax plants in the greenhouse eventually stopped producing new leaves regardless of the irrigation or fertilizer regime being tested. Photoperiod had no influence on renewing growth. 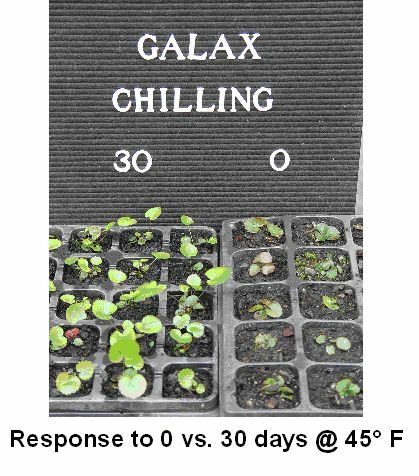 However, in a test of seedlings from two provenances, it was determined that 30 days in a 45° F cooler stimulated 95% bud break. Sixty days of chilling produced no greater percentage of bud break but did result in an accelerated rate of bud break. SHADING: Plants grown in full sun were light green, often scorched and grew poorly while those in at least 50% shade looked best. Burlap provided practical and effective shade. PLOIDY: Galax is an autopolyploid with diploid, triploid and tetraploid populations existing naturally. Random collections of leaves from different provenances as well as leaves that had been purchased for resale by a commercial firm were evaluated using a Partec PA flow cytometer. Preliminary data suggests that most of the leaves harvested for the commercial florist trade (>3.5 in. diameter) are naturally occurring tetraploids. NUTRITION: Soil test results from areas where wild galax is growing indicate that soil pH ranges from 4.2 to 4.5, calcium and magnesium are very low and phosphorus is available only in trace amounts. Most roots exist in decaying leaf litter. It is assumed within the botanical community that mycorrhizal associations are essential for galax survival but no mycorrhizal species have been isolated (Neufeld). Studies were established to evaluate growth utilizing Wilbro (now Harrell’s) 19-5-12 Plus controlled release fertilizer top dressed and a separate study with the fertilizer incorporated. The application rate in both tests was 0, 1.5, 3.0, 5.0 or 8.0 pounds per cubic yard. Excessive plant mortality existed for all top dress fertilization. Nearly all plants at the incorporated 5.0 and 8.0 rates died quickly. Conductivity readings determined via the Virginia Tech Extraction Method were very high at the incorporated 5 and 8 pound rates. There was little or no growth when plants were unfertilized. 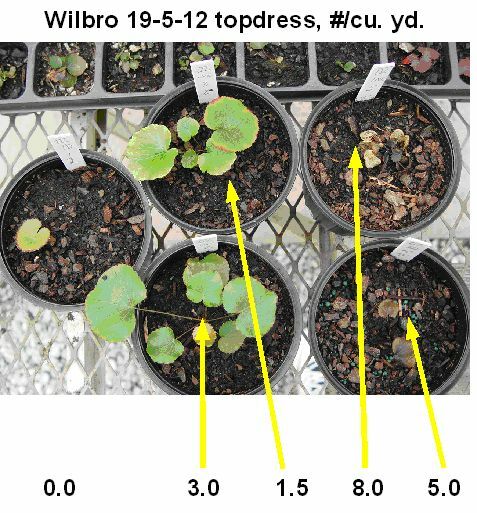 There was some plant death at the 3.0 rate and none at the 1.5 rate suggesting that these two rate merit further investigation. Fertilizer studies were also conducted in which 4 phosphorus rates were established in container media by incorporating and thoroughly mixing 0, 0.56, 1.12, or 2.25 pounds of nitrogen per cu. yd. Plants were irrigated weekly for four months with four rates of nitrogen from ammonium nitrate. These solutions were 0, 50, 100 or 200 ppm N. Aliquots were determined such that there was no nutrient leaching but the available pore space of the growing media was filled. Best growth was at 0, 0.56 or 1.12 P rates at 100 and 200 ppm nitrogen applied weekly.